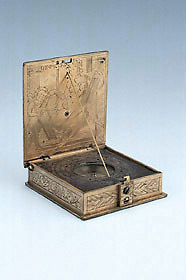 The outer side of the lid has a pierced lunar volvelle with aspectarium and the twelve principal winds named in Latin. The dial can be adjusted for three different latitudes. On the closure catch is engraved the signature 'C ? T ? D ? E ? M ? 1613': Christoph Trechsler Der Elter Mechanicus. The inner face of the lid has an allegorical engraving representing 'GEOMETRIA', a woman with a pair of dividers in her hands.